Welcome to the Regatta Blog Hop. If you arrived here from Mez's Craft Room you are in the right place, if you arrived by chance no worries, just continue the hop by clicking the link at the end of this post. The Regatta papers and compliments are really lovely. 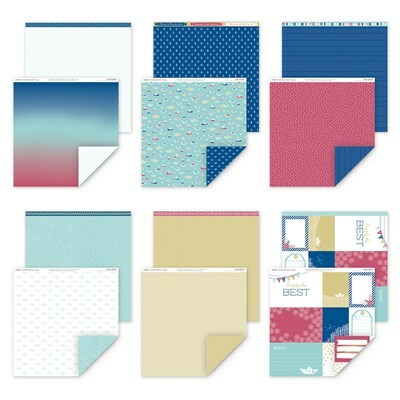 The paper pack contains 12 sheets of papers two sheets of five different doubled sided designs and two sheets of journal and decorative boxes. The compliments pack has nautical and floral elements and titles. 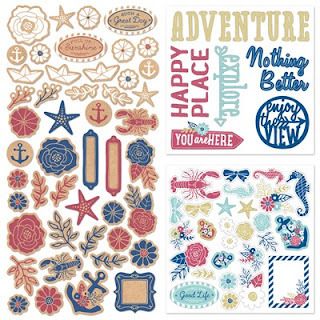 I enjoyed creating with with this set, I love the colours and have made two cards with a nautical theme, they were fun and simple to make. I look forward to using the Regatta pack to do my photos from my trip to the Bahamas last year but I wanted to show that these papers can also be used for other types of layouts as well. These photos are from my 60th birthday. I have used the Glacier and Flaxen papers and Glacier and Pomegranate inks. The stamp set I used is Shower Flowers C1612 I fussy cut the flowers and leaves, then adhered them with the foam tape. Thank you for joining our blog hop, to continue hop along to Vandra's Virtual CTMH Craftroom and see what special project she has created. If you wish to leave a comment it will be greatly appreciated. Wow! Super cute and awesome inspiration! Thank you! Great cards, and that layout is stunning! I love your little circle pirates the best. So cute! You are very clever!